A Video Assistant Referee decided penalty, a gift goal, an own goal and three other memorable goals highlighted the final game of the tournament as Didier Deschamps ensured he won the World Cup both as a player and a coach for France. France took the lead only 18 minutes through a Mario Mandzukic own goal but the Croatians restored parity ten minutes later through Ivan Perisic but Emmanuel Macron’s boys restored the lead seven minutes before recess. The French were in the 38th minute awarded a penalty by Argentine referee Nestor Pitana for handball against Perisic in the 18 yard box , a spot kick that was decided after a lengthy delay saw the Video Assistant Referee being consulted. Antoine Griezmann sent the Croatian goalkeeper, Danijel Subašić the wrong side for the French to restore their lead. In the second half, France took the game beyond reach through two youngster Kylian Mbappe and Paul Pogba goals but Croatia pulled one back through Mario Mandzukic. A Hugo Lloris error that saw him hesitate to clear the ball was taken advantage of by Mandzukic for the Croatians who had dominated the game to pull a goal back but this was not enough for them to cause damage to the French side that was determined to win their second World Cup trophy, only a day after the country celebrated the Bastille day. Croatian players were left crestfallen by Sunday’s result in Moscow after a colorful display during the entire tournament. 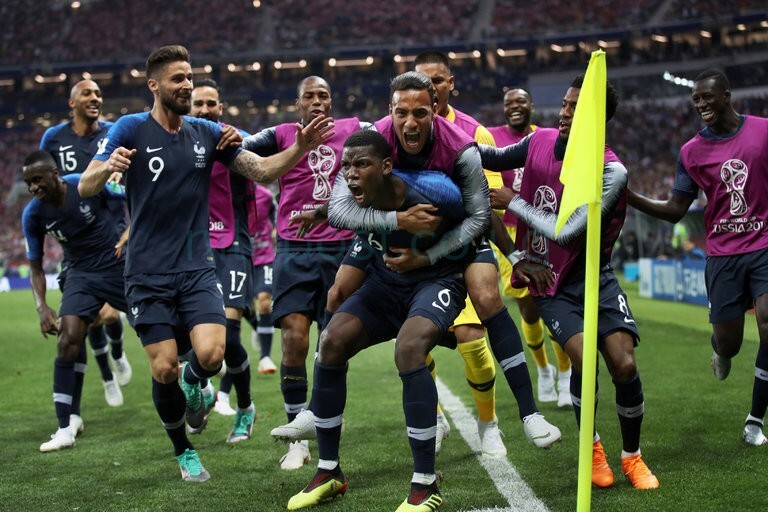 The win ensured Deschamps lifted the trophy for the second time in twenty years after winning it as a player in 1998 when France beat Brazil in the finals played in Paris. Croatia however had something to smile at as their captain Luka Modric was voted the Most Valuable Player, having been man of the match three times in the 2018 World Cup in Russia. Before the start of the game in Moscow, the Russian president Vladimir Putin passed over the ball to Sheikh Tamim bin Hamad al-Thani, the Qatar Emir whose country will be hosting the next world cup tournament in 2022. The event will this time be played between November and December. Brazil hold the record of winning the world’s most coveted football tournament at five times, Germany and Italy at four, whereas France, Argentina and Uruguay have both won it twice. Spain and England have each won the World Cup once.